I’m almost sure that everyone gets a case of the Sunday Blues at some point. However, I’ve learnt that Sunday can actually be your most valuable day of the week. Don’t get me wrong; I still sometimes get that lingering feeling of wanting just one more day… but it’s all about crafting a routine that will reinstate a positive state of mind even if you do fall into a bit of a Sunday lull. My Sunday Soak is one of my favourite parts of the weekend. I know that I can use that time to indulge in me, myself and I, which is actually quite a rarity for me. The best part of a Sunday Soak is that you can customise it totally to you! So I thought I would go ahead and share my routine with you and hopefully inspire you to take some time for yourself. I start my Sunday Soak by giving myself an Aromatherapy Steam Facial, which allows you to completely de-clog your pores, as well as giving you a chance to unwind. It’s always best to lightly cleanse and exfoliate your skin before doing this, as steaming will draw out impurities that sit deeper within your pores. All you need to do is get yourself a bowl big enough to comfortably support your head, choose an aromatherapy oil (Lavender OR Eucalyptus are good ones to start with and can be found at Holland & Barrett) and finally add a spritz or two of your favourite toner. Place a towel over you head for ten minutes and gently inhale and exhale. Once you have completed this spritz some toner on a cotton pad just to remove any impurities that have risen to the top of your skin. My two favourite toners are the Elemis Soothing Apricot Toner and the Omorovicza Queen of Hungary Mist, which are both great for hydrating and re-balancing the skin. Now that your skin is clean it’s a good time to pick a face mask that will address your skins needs. Why not try multi-masking if your skin is combination? A favourite of mine is the Origins Original Skin Mask, which is a 2-in1 clay mask made with Mediterranean Rose Clay, Canadian Willow Herb and exfoliating Jojoba beads that help to address the skins texture, clarity and install brightness back into your complexion. I also really like the LUSH Bunny Moon Jelly Face Mask, which is full of chamomile goodness and is a real winner for anyone with sensitive skin. Face mask on. Check … it’s time to relax! I love making my bath as enjoyable as possible, so crumbling a delicious bubble bar or blitzing my bath with a bath bomb is a must. A current favourite of mine is the LUSH Man In The Moon Bubble Bar, which uses the power of Neroli and Lime to lift your mood in an instant. Cocoa butter and Olibanum oil also help to soften skin and your state of mind. A good skincare routine can really go a long way in not only making your skin better, but also helping you to further relax. I always try to be mindful when doing my skincare routine, by taking time to appreciate the different scents and textures. Just a warning, I do go all out on a Sunday, so you might want to grab a hot drink if you wish to continue! Once my face mask is removed I give my face a final tone with my Elemis Soothing Apricot Toner, which restores balance after steaming and wearing a mask. I then apply my current serum the Kypris Moonlight Catalyst, a majestic serum that is brimming with pumpkin enzymes to accelerate your cells natural turnover, hello smooth and plump skin. I then follow up with my new love the ESPA Optimal Skin ProSerum an intensively nourishing serum that strengthens the skins’ natural moisture barrier, as well as using key ingredients to minimise signs of ageing, plus it smells ah-mazing and is also used within most professional ESPA facials. To add a final boost of moisture to my skin, I finish with a light layer of the Estee Lauder Revitalising Supreme+ Global Anti-Ageing Cell Power Crème, a real powerhouse anti-ageing moisturiser that adds moisture, bounce, glow and radiant vitality to your skin. Finally, I treat my eyes to the Odacite Eye Contour Serum Concentrate which I have raved about many times on my blog, followed by my trusty Estee Lauder Advanced Night Repair Eye Cream. 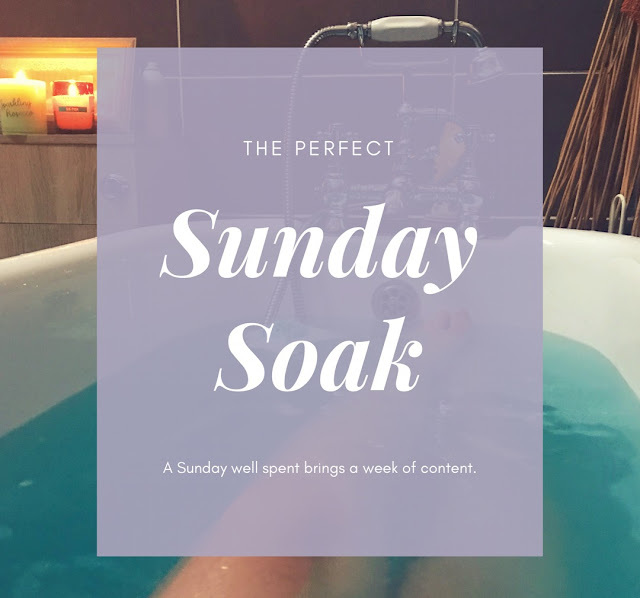 To finish off the perfect Sunday Soak, you need to remember to look after your body, which is something I forget most of the time! Take your favourite moisturiser and wrap yourself up in your favourite silky smooth crème. My number one right now is the LUSH Sleepy Cream. It’s honestly sensational and makes me feel truly delicious! A gorgeous blend of Lavender and Tonka Bean not only makes your skin soft, but helps to induce a sleepy state of mind – Say goodbye to those Sunday blues! A spritz of your favourite relaxing scent or pillow mist can really go a long way in helping you doze off. I adore the Elemis Temple Balm and the NEOM Organics Pillow Mist, which both set the scene for a lovely sleep. I know it’s not for everyone, but I couldn’t be without my Holistic Silk Eye Mask, which helps me to well and truly turn off. This is the first blog post I've written in a little while and it feels great to be back and writing about something I love. I would love to know what you do to relax on a Sunday?